Why is the Church of England dying? So far we’ve visited several cathedrals and chapels of the Church of England, a Hindu temple, a Sunni mosque, and a synagogue, and as far as I can tell, Christianity seems to be the only dying religion in England. To be fair, I’ve only visited really famous cathedrals and they’re bound to be turned into museums because of their history, but regardless, church attendance in England, belief in a God: way down. I’ve been racking my brain to figure out why, and I think the best I can do is work through a few of the commonalities among all the holy places I’ve seen. The temple, the mosque, and the synagogue all emphasized their connections to the community and the multi-functionality of their buildings when we visited. In fact, at the mosque, the man we spoke to said “children come to play and then to pray,” suggesting that a multi-purpose building keeps the religion thriving. But at St. Paul’s our tour guide said that prior to the Great Fire, church had become “run down” because it was being used for multiple purposes (markets, dentist, etc), so the argument works in both directions and doesn’t really get us anywhere. All four faiths also emphasize the importance of their religious history, the history of their specific holy building, and their place in it. Weirdly, this seemed to strengthen identity for some, and weaken it for others. Jewish history, as a group in diaspora, is such a uniting force that it allows for an entire Jewish culture and identity that complements the religion. Christian history seems to obscure it. 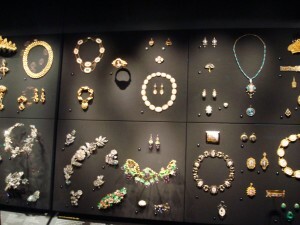 Instead of learning about Christianity at the chapels and cathedrals, we treated it like a museum, viewing artifacts. I again want to attribute this to imperialism. Groups who live under the threat of obliteration hold their roots tighter. Even though the Protestants and Catholics have been intermittently persecuted, Christianity has been associated with England for quite a while, and England is not in danger of going anywhere. I also noticed that all the non-Christian faiths emphasized the fact that they were not evangelical. While they aim to teach others about their faith, they do not actively convert, while active evangelism is an important part of Christianity (most orthodox sects). It seems like an interesting coincidence that England, an imperial nation that converts other nations to Englishness, would be attracted to a religion that converts followers (Ironically, the opposite seems to be happening). Christianity can easily be transformed into a tool for imperialism. Maybe that perversion coupled with the expectation that it will just always be there is what has caused its downfall. London’s diverse museums all have an element of British imperialism. 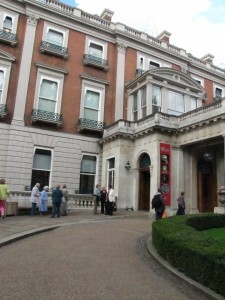 The three which best show this are the Wallace Collection, the Sir John Soane Museum, and the British Museum. Yet, each takes a different approach to them: the British Museum is the standard artefact with didactic label, the Soane shows the spoils of an imperialistic age in the wonderful cabinet of curiosities method, and the Wallace Collection arranges its collection as a wonderful combination of the two. The Rosetta Stone, which has been a centerpiece of the Egyptian repatriation demands. 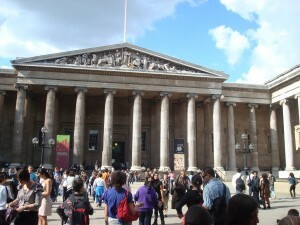 We’ll start with the British Museum. 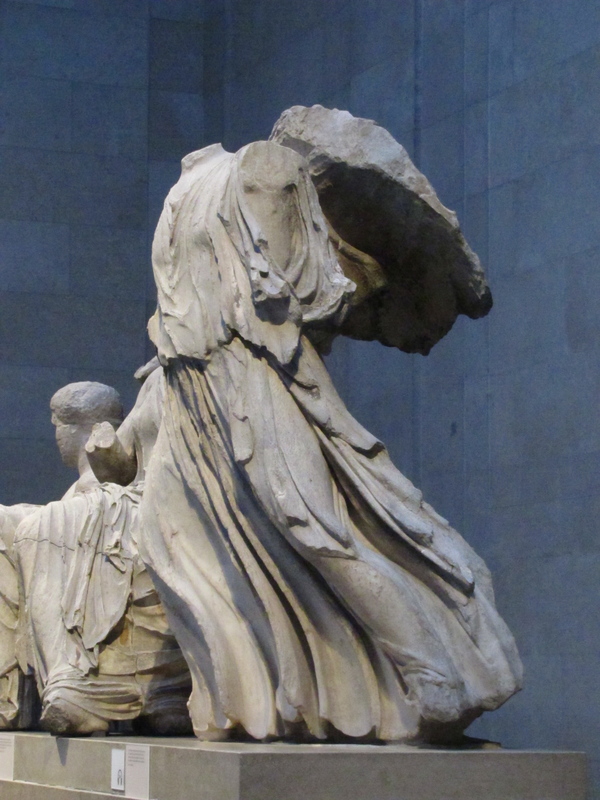 Perhaps the most controversial collection because of the Elgin Marbles, most of the collection could probably be at the center of a repatriation argument if a government decided to challenge the museum. Instead of noticing that the museum was a shrine to British imperialism, my first thoughts (once I pulled myself away from the medieval galleries) were about the museum’s role in the ongoing battle over countries reclaiming their artefacts. My general beliefs on repatriation are simple: the works belong wherever they are going to get the best care, which, unfortunately for the vast majority of the ancient objects, is not in their countries of origin. For example, there is no way that Egypt can assume responsibility for its antiquities; the ones there are deteriorating alarmingly. While Hawass has done a good deal for Egyptian antiquities, their facilities still are nowhere near those of the British Museum’s facilities. Furthermore, shouldn’t objects that have influenced the whole of history be where the most people have access to them? Surely that is here, in London, not in Cairo? Unfortunately, that argument is no longer valid for the Elgin Marbles (although, while not as an unpredictable environment as Egypt, Greece does have its problems which could threaten the marbles). Greece has a new acropolis museum that is a perfectly suitable house for the marbles. So, why do I still believe they belong in London? 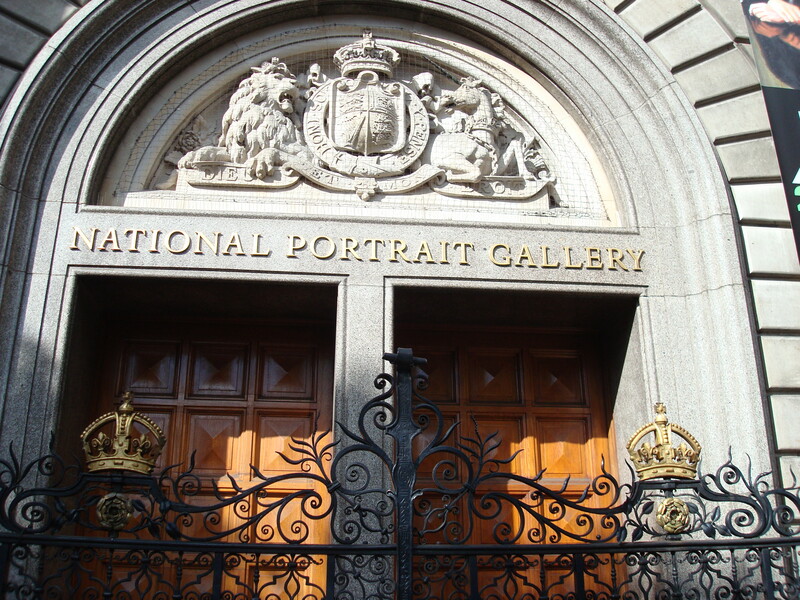 Aside from the whole no-objects-can-leave-England-law and the incredible galleries they are currently housed in, there a couple of reasons. Firstly, their provenance, unlike that of the Italian krater the Met repatriated to Italy, shows them to have been purchased legally versus outrightly stolen. We may not agree with the way they were handled in the 19th century, but because we have a different understanding of the proper way artworks should be sold/purchased does not mean we can go back and make amends with everything. The world’s great museums would be emptied. Secondly, where they are now, they are more accessible. If Greece didn’t have almost as many as the BM, I’m sure everyone would feel differently about the issue. (Well, except for Greece, which would still demand them all, even in the BM only had one.) Because repatriation has become such an important issue, I do believe that even if English law did not forbid it, the marbles would never go back to Greece because once the BM accepts Greece’s arguments, the watershed for repatriation will be open and museums will be scrambling to quadruple check their works’ provenances, possibly wasting valuable resources. 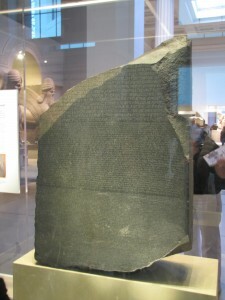 It was only after my second visit to the British Museum that I wondered about some of the works’ provenances. However, from the moment I stepped into the Sir John Soane, all I wanted to do was demand to see some of the provenances of various works, as well as pick up the objects to examine them and the way that they were removed from their original locations. I think part of the reason that it took a second visit to the BM to question it was as one of the leading museums in the world, it has more authority as the stellar, but smaller, Soane. The traditional layout of the BM commands respect, whereas the Soane is easy to mistake for a pile of junk haphazardly arranged. Except, it is the exact opposite: the Soane has incredible pieces. (I could have died of joy looking at the random Gothic bits.) Because of the arrangement- a life size cabinet of curiosities- it is easy to forget that all of the works can point to the achievements of Soane and his time, noticeably imperialism. When walking through, one’s mind is trying to take in everything and is not assisted by didactics, the larger picture is sometimes lost, unlike at the BM, where the layout and didactics remind you almost constantly that while the museum is “British”, the majority of the collection is not. Furthermore, the Soane’s arrangement allows one to feel closer to the objects. Indeed, it is easy to get away with a close examination of the work on the wall and touching them. In the BM, the viewer is often annoyingly separated from the work by class or a rope barrier. If the BM is arguably the most controversial museum because of its collection, then the Soane is the most overlooked for controversy. Lots of the works were supposedly removed from crumbling sites. Were the sites crumbling before or after the works were removed? Did the dealers have explicit permission? These questions are largely overlooked; in fact, lots of information is overlooked, which adds to the feel of a cabinet of curiosity. The Wallace Collection is like the Soane in that it started as one cohesive collection and has grown, as well as that it shows the way the works were staged by their original collector. However, unlike at the Soane, the Wallace Collection does an amazing job of showing lots of works in a way that is not as overwhelming. The collection is mostly housed in period rooms, which add to the atmosphere of the museum, greatly enhancing the works. Instead of wondering about whether the objects should be repatriated, the collection sets up the works in such a way that the viewer is not distracted by theoretical questions on museum practices. (Unless said viewer gets bored of Rococo and armour.) Furthermore, the collection focuses on European art, which focuses it a bit more than the other two museums. If anyone is interested in armour, the Wallace’s collection is superb and world-renowned. Instead of wandering around the museum pointing to works I wanted to examine for causes to repatriate, I wandered the Wallace wondering why certain works were hung together and why anyone would want rooms upon rooms of Rococo art, much less why I was wondering around them when there were three outstanding armouries downstairs that were calling me. Yet, part of me wonders if Britain didn’t have it’s imperial past, would I be able to see this quality of art and artefacts. If I were able to, would I wonder about the provenance and history of each work as much?